Singapore was gripped with enbloc sale fever in the first half of 2018, a momentum that started gathering since early 2017, beginning with the Shunfu Ville transaction. The period witnessed the successful closing of several big ticket – near billion dollar – deals. We then saw the sudden implementation of a raft of property cooling measures in July 2018, involving increased stamp duties and lowered housing loan limits applying to residential property transactions, including for enbloc sales and purchases. In the months leading up to the introduction of the July 2018 cooling measures, however, we were already starting to see the enbloc sale market tilt in favour of the buyers. This was largely due to the increasing supply in estates attempting to sell enbloc, and the developers having somewhat replenished their land banks for new projects. This led to a widening gap between the sellers’ expectation of the sale price, and what developers would be prepared to tender, in order to sell their new projects profitably. As a result, many sale tenders closed without receiving any bids. Deals were still being done, but developers were becoming more selective of sites. The introduction of the July 2018 measures dampened the market further. The applicable Additional Buyer’s Stamp Duty (ABSD) rate payable by developers was raised by an additional 10%, if they do not manage to complete and sell their new projects within a 5-year time frame. At the same time, an upfront, non-remittable ABSD of 5% of the land price is payable by the developers, adding pressure on the developers’ thinning margins. The result of the cooling measures is that developers were now prepared to pay less to acquire land sites, in order to maintain margins, and also to mitigate the risk of paying 25% ABSD plus interest. Mega land sites (including many priced well over S$1 billion), in particular, represented heightened risk for developers. Since the start of Q4 2018, several sites on the market which were not sold were relaunched for public tender, some maintaining the same reserve price, and several others with lowered asking prices. There are also news reports on estates which are in the process of collecting the requisite 80% majority approvals, and which have increased the reserve price, predominantly to boost the owners’ interest and buy-in to the collective sale attempt. Under the current collective sale laws in Singapore, once an estate reaches the requisite 80% majority, an attempted collective sale must first be initiated by a public tender. If there is no successful bid at the close of the public tender, then a 10-week window opens for the Collective Sale Committee (CSC) to negotiate a collective sale with any interested party by way of private treaty. If the interested buyer offers less that the reserve price or the fair market value as at the close of tender, or if the offered terms are outside the scope of the collective sale agreement, then the CSC has to come back to the owners to secure the requisite 80% approval on the new terms. Once this 10-week window closes, a fresh public tender will need to be relaunched, with the said private treaty negotiation window opening again upon tender close. For sites relaunched at the same reserve price, it could mean that the CSC, as advised by their property consultants are confident that a successful deal could be reached at or higher than the reserve price. The relaunch thus extends the private treaty negotiation window for the site by affording estates a second chance at engaging potential buyers. For sites that have decreased the reserve price, the CSC may have considered the state of the market, and are attempting to see if developers will come forward based on a more realistic asking price. Estates have up to 12 months to secure a buyer from the date that they achieve the requisite 80% majority consent. There is, therefore, a limited number of public tender / private treaty negotiation cycles that an estate can attempt within this 12-month period, before the transaction lapses, and the entire process has to be restarted from scratch. Needless to say, an enbloc sale attempt is no small endeavour. It involves much time, some expense and disruption to the day-to-day lives of the owners. Selling owners who sign up for the enbloc sale are in property limbo until the enbloc sale successfully completes or the collective sale agreement expires and lapses. Given the current market sentiment (of the developers), sale sites still on the market may have a more realistic chance at a successful collective sale if the sellers’ price expectations can match what the developers might be prepared to pay. Overall, a consistent and measured property market benefits all stakeholders and the country, and the same also applies for the enbloc sale market. Collective sales bring renewal for Singapore, and offer existing owners of aged estates a chance of a convenient exit with a premium, whether to move on and maintain existing lifestyles or to monetise existing assets. Enbloc sales also allow for new freehold developments in the market. It is hoped that the enbloc sale market continues to move at a measured and sustainable pace without the sharp spikes and troughs, and realistic pricing expectations on both sides is a good starting point. Have a question about property? If you have any questions, you can request a quote with Kenneth Szeto or Benjamin Hong. You can also get a Quick Consult with other lawyers from a transparent, flat fee from S$49. You can expect a call back within 1-2 days on the phone to get legal advice and have your questions answered. This article is written by Kenneth Szeto and Benjamin Hong from Withers KhattarWong LLP . Kenneth's practice focuses on banking, finance and corporate transactions specialising in the real estate industry. He acts for lenders, borrowers in onshore and offshore financings, with a focus on real estate and asset-backed financing transactions. He also represents corporate and individual clients on acquisition and disposals of real estate, collective sale and purchases, sale and leasebacks, commercial leasing and structured real estate investment transactions across the commercial, industrial and residential property sectors. His clients include banks and leading financial institutions, property developers, multinationals, SME businesses, family offices and high net-worth private clients. Kenneth has been recognised in the Asia Pacific Legal 500 (2017 and 2016 editions) as a "Recommended Lawyer for Banking and Finance", and Asia Pacific Legal 500 2015 edition as a "Recommended Lawyer for Banking and Finance as well as Real Estate and Construction". 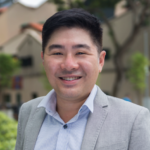 He was named by the Singapore Business Review as one of Singapore’s 40 most influential lawyers aged 40 and under in 2015.